AMERICAN HERITAGE® Chocolate has a unique place in the history of MARS, Inc. and in the hearts and minds of people all over America who appreciate an artisanal, authentic approach to making and celebrating chocolate. Conceived of, and crafted by, a dedicated team of historians and the legendary advocate of American History and chocolate’s unique story in the Americas, Forrest E. Mars, Jr. in 2006. To celebrate chocolate’s global influence on our American culture, a story of connection that brings people together, spanning time and place, AMERICAN HERITAGE® Chocolate invites you to try their recipe below. It will yield 6 servings. 1. In a small bowl, whisk together the cornstarch and ½ cup of the milk to make a smooth paste. Set aside. 2. In a medium pot over medium heat, combine the remaining 1 1/2 cups milk, the water, chocolate drink mix, sugar, and salt. Whisk occasionally, until steam begins to appear, about 5 to 6 minutes. 3. While whisking, add the cornstarch mixture to the pot, in a steady stream. Continue to whisk until mixture reaches a thick, pudding like consistency, about one to two minutes. 4. Remove from heat, and pour pudding into six small ramekins. Cover each pudding with plastic wrap and refrigerate for at least 3 hours, until chilled and set. 1. In a small saucepan over medium heat, place all ingredients. Bring to a simmer, stirring until sugar has dissolved, about 2 minutes. Remove from heat and set aside. 2. Once the pudding has had a chance to chill and set, discard bay leaf from the sugar syrup, and spoon a tablespoon of syrup over each pudding. 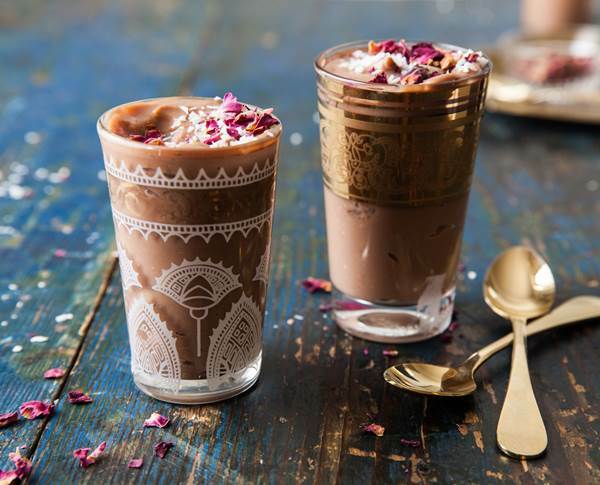 Top each pudding with a bit of shredded coconut, and a sprinkle of dried rose petals, if using. I have made chocolate pudding, but never a chocolate Muhallabieh. I like the idea of adding a syrup on top with coconut.